The Amazonia Collection is committed to providing premium quality sets with an elegant design that will make your home stand out above the rest. Crafted from solid Eucalyptus Grandis wood, grown in 100% managed forests in Brazil and certified by the FSC (Forest Stewardship Council), this eucalyptus furniture is known for its longevity and craftsmanship at an affordable price. Enjoy your patio in style with these great sets from our Amazonia Collection. 1 sofa 27 inch W x 44.5 inch D x 29.5 inch H. 2 armchairs 28 inch W x 24 inch D x 29.5 inch H. 1 coffee tables 19.5 inch W x 38 inch D x 13 inch H.
Wood is a natural material. Its appearance evolves over time. To preserve its original appearance, sand in the direction of the wood grain and apply wood sealer. Do not use a pressure washer. 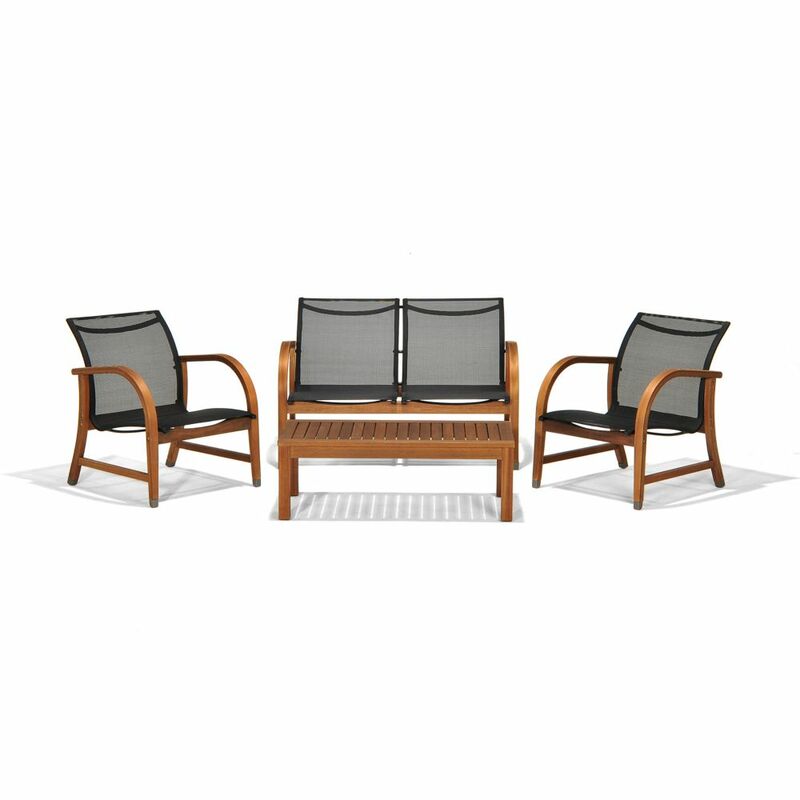 Relax in style and sophistication, and enjoy the outdoors with the Beacon Park 4-piece chat set. A sturdy, rust-resistant frame supports intricately woven, rich brown wicker, and features a plush olefin seat cushion and back cushion. Wide, curved armrests ensure maximum comfort you won't want to give up. Use as a standalone set, or include other Beacon Park furniture elements to create a complete look. Enjoy your outdoor space with the Hampton Bay Cambridge patio furniture set made with beautifully hand-woven wicker and durable steel furniture frames. The patio chairs and loveseat boast deep, plush weather resistant cushions for ultimate comfort and longevity. The coffee table has a wood woven top and handy bottom shelves for extra storage. Perfect for your porch, patio or sunroom, each patio furniture set includes two lounge chairs, one loveseat and one coffee table. Enjoy your outdoor space with the Hampton Bay Laguna Point patio furniture set made with beautifully hand-woven wicker and durable steel furniture frames. The patio chairs and sofa boast deep, plush weather resistant cushions for ultimate comfort and longevity. The coffee table has a tempered glass inset and handy bottom shelves for extra storage. Perfect for your porch, patio or sunroom, each patio furniture set includes two lounge chairs, one sofa and one coffee table. Enjoy your outdoor space with the Hampton Bay Spring Haven patio furniture set made with beautifully hand-woven wicker and durable steel furniture frames. The patio chairs and sofa boast deep, plush weather resistant cushions for ultimate comfort and longevity. The coffee table has a tempered glass inset and handy bottom shelves for extra storage. Perfect for your porch, patio or sunroom, each patio furniture set includes two lounge chairs, one loveseat and one coffee table. Manhattan Eucalyptus 4-Piece Patio Deep Seating Set The Amazonia Collection is committed to providing premium quality sets with an elegant design that will make your home stand out above the rest. Crafted from solid Eucalyptus Grandis wood, grown in 100% managed forests in Brazil and certified by the FSC (Forest Stewardship Council), this eucalyptus furniture is known for its longevity and craftsmanship at an affordable price. Enjoy your patio in style with these great sets from our Amazonia Collection. Manhattan Eucalyptus 4-Piece Patio Deep Seating Set is rated 4.3 out of 5 by 7. Rated 5 out of 5 by Danielle from Great set for our smaller patio. Sturdy and comfortable!... Great set for our smaller patio. Sturdy and comfortable! Rated 5 out of 5 by JB from The Amazonia set is extremely well made and easy to put together. It was incredibly well packed ... The Amazonia set is extremely well made and easy to put together. It was incredibly well packed in a very compact form. Looks amazing! Rated 1 out of 5 by bug from Unpacked the (heavily damaged) box, all parts there. Assembled the table without trouble. Then ... Unpacked the (heavily damaged) box, all parts there. Assembled the table without trouble. Then came to the chairs - the holes on the seat do not align with the holes on the wood frame. No way to assemble the chairs as the holes for the screws simply do not line up. I even tried both seats to see if one was bent - same result. Now what are we to do with this mess? There's no way to repack the contents and I'd have to disassemble everything I spent an hour working on. Will contact Home Depot and hope to have this rectified. Rated 5 out of 5 by Anonymous from No cushions no worries. I had a wicker set and the maintenance that went along with it was painful. This set has comfortable chairs and is made with a very nice quality. Applied sealant and ready to entertain. Rated 4 out of 5 by sylvie from works for my needs Yes, the chairs are low but very comfortable. I wish I could get 2 more chairs ...I set the sofa, coffee table and 2 chairs under a 10' square wooden cover. The wood in the chairs and the cover matched well. I have watched our friends and they all seem to be drawn to the set up. I love it. Rated 5 out of 5 by Joseph from My wife loves it A little smaller than i thought, but still like it. Rated 5 out of 5 by Vicbil from Beautiful set...sleek, modern & no cushions to worry about We just received this set. It is well made & looks great on our new stone patio. There are no cushions to schlep in & out and it is most comfortable to sit on. My only regret is that I cannot purchase more side chairs separately. Overall a very good value.